Click here to contact companies that will help arrange and manage your shows/tour in Japan. If you are searching for "booking agents" in Japan you will not find any. In the West, you often hire a booking agent to book gigs at bars, clubs and other venues. They usually do not charge you up front but take a cut from your pay. In Japan, bars and clubs do not hire (book) bands unless you are a famous DJ or jazz artist. There are some cafes and restaurants that may sometimes have live music, but usually acoustic or singer/songwriter types. If you're indie, don't expect to get paid. Venues do not usually pay bands to play. So since there is no pay to take a cut from, booking agents do not exist in Japan like they do in the USA, Canada and other countries. There are a handful of big concert organizers/promoters in Japan, but they only work with relatively famous artists and their record labels that they know they can make a profit from. They get paid to organize the concerts and get a share of revenues. If you are not known in Japan or on a respected label in Japan, they will not be interested. If bars and clubs don't book bands, then where do bands get gigs in Japan? 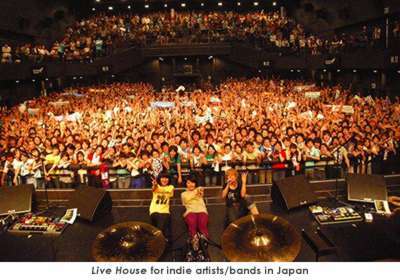 The venues where most indie artists/bands play is called a rai-bu house (live house). These are privately owned and operated venues set up especially for live musical performances. They may also offer food and bar service. Some are designed like upscale clubs with world-class sound systems, lighting, and stages with seating capacities over 1,000 people while others are a little more sparse in terms of interior design and equipment (i.e. a neighborhood pub). Most fall in-between. There are hundreds in Tokyo alone and all across Japan in most major cities and even smaller towns. Venue capacities typically can range from 30 to a couple hundred people. All drum kits, amps, PA, lighting, and engineers are included or can be rented. Some live houses will hold auditions and then "book" bands for certain nights. 3-5 bands may be booked for the night and each band may get a 15-45 minute set. There is usually no pay. The bands usually have to sell a set number of tickets (e.g. 20 tickets at $20 to $40 each). If they don't sell their quota then they must pay the difference. For foreign bands, this doesn't apply. Since foreign bands cannot fly to Japan just for a 5-minute audition, it is important to set up a web/mobile site in Japanese complete with music samples, videos and press kit in order to impress venue owners and managers. It is also a good idea to contact Japanese artists/bands or their record labels in your genre who may be able to put you on their show schedule. They won't pay for any of your expenses but you don't have to setup the gigs yourself or do any promotion. If you can speak Japanese, have a good budget, and are keen at event production then you can book a live house (i.e. rent the space) yourself. In Tokyo, rental fees for a decent live house can range from $1,000 to $5,000 for a Friday, weekend, or holiday night. You get the venue from about 3PM to 11PM (soundcheck usually at 4PM). Shows typically last from 2 to 3 hours maximum and start anywhere between 6 to 9PM. The live house usually opens its doors 1 hour before start time. There are hefty charges if you go overtime. Tickets and merchandise can be sold to recoup costs. Live house operators usually have no problem renting their venue to a foreign band/event producer/record label as long as they get paid the rental fees. They don't care about your other expenses like airfare, accommodation, etc. If you are not receiving any "pay" for the show (i.e. no employment/hire income) you do not need to get a special work visawhich can take a long time. If you have a valid passport and come from a country which has a visa requirement waiver agreement with Japan (USA, Canada and most European countries) then you can enter Japan on a temporary visitor's entry stamp which is normally valid between 90 days and 6 months depending on your nationality. If the Japanese immigration officer finds that you have a criminal record then you will not be permitted to enter Japan. Please check with your nearest Japanese consulate or embassy for details. If you are lucky enough to be invited to play in Japan by an event organizer, then that is great. There are several music festivals held during the year in Japan. Click here for a list of music festivals and conferences in Japan that invite/book foreign artists. If you have sent your music and press kit to the right people in Japan, you may be surprised with an invitation to play. Creating a Japanese web/mobile site is a good start at getting some attention in Japan. Click here to get a Japanese web/mobile site and add yourself to the TopMusic.jp Music Guide. A live house has everything so the band only needs to show up with a guitar, bass and pair of drumsticks. This helps "indie" artists to travel light since many will use the train system to get to gigs. Guitars, basses, synths, pianos, etc. can sometimes be rented at the live house. The Tokyo area has a population of 35 million (greater than the population of many countries) so you may want to only play in this area depending on your budget. However, since Japan is about the size of California State and the train system vast, fast and reliable, it is possible to play gigs in many major urban areas throughout Japan. Osaka and Nagoya are the 2nd and 3rd largest cities respectively. The bullet train can take you to northern cities like Sendai and Niigata or southern cities like Fukuoka and Hiroshima in several hours. With a Japan rail pass, you can cover most of the country in a short period of time relatively inexpensively (assuming you don't have tons of gear and a huge entourage) and establish a good fan base in one tour. Some tours have the band playing 7 shows in 7 different citiesall in 8 days! If you're coming from America then you will start feeling sleepy late in the afternoon or early in the evening Japan time and wake up very early morning Japan time so you may want to give yourself a couple of days to get used to the time change if your budget allows (or else drink a lot of can coffee or energy drinks from the vending machines). A live tour should be coordinated with other advertising and promotion to be most effective. In addition to posting your tour schedule in your Japanese web/mobile site, there are several music websites in Japan where you can promote your live house tour. Most live houses will use flyers and posters to promote the shows that they organize themselves. If you are renting the live house for yourself then you will have to do this yourself or hire someone to do it. In most cases, if people know it is a foreign band, they will be more interested in checking you out. Needless to say, you should also have your music readily available for Japanese to purchase either from a traditional retail shop in Japan or a website that caters to Japanese customers and that accepts YEN in the popular payment methods in Japan. You can sell your CD's and downloads directly from your Japanese web/mobile site so all you have to do is let the audience know your web/mobile site URL (use QR Codes). A good idea is to get a bunch of bands/artists together so you can all share the expenses (and experiences) of a live tour in Japan. Some record labels bring over 3 to 5 bands/artists for one tour (i.e. a showcase for the label). Remember, the main goal of doing live shows in Japan (your first tour anyway) is music promotiondeveloping a fan base and generating publicitynot making an income. It is a marketing cost that you or your record label pays in order to increase awareness and sales of your music in Japan. Nevertheless, a tour of Japan is a fun and wonderful experience for most foreign artists/bands. The best form of promotion is performing live shows in Japan. Live shows/tours are the best way to establish a loyal fan base in Japan and to promote your music. It also helps in getting publicity in other media and motivates your distributor to push your product at stores. Use one of the companies that specializes in planning and managing live shows/tours for foreign indie bands/artists and record labels. The costs of touring in Japan will vary depending on the number of members and amount of tour support services required. In addition to everyone's transportation, accommodation, food, and other personal costs, the tour planning/management company must also be paid for its services. Don't expect to make any income or a profit. If you are wondering how much doing a Japan tour costs, simply go to your local travel agency and ask them how much a standard tourist package would be for Japan (staying 7 days and visiting Tokyo and maybe Osaka) for the number of people in your bandthen add some extra to come up with a conservative budget for your tour! If you have that budget ready and at least 4 months leadtime (and valid passports with no criminal records) then contact the companies that specialize in the planning and management of live tours and shows for foreign indie bands/artists and labels in Japan. You can plan an affordable tour yourself if you can get discount airfare to Tokyo from your country. For cheap accommodations in Japan, try AirBnB. You can find rooms from $30/night. Click here to see some of the bands/artists from your country that are doing gigs in Japan.